For the next to last day of June, the plan was to do the grounds tour at the Indianapolis Motor Speedway, find a place to do some walking, then spend the late afternoon/evening with the Mealys. Like in Chicago, we were carefully watching the weather to see if it would rain. Unlike Chicago, however, the grounds tour we were looking to take only happens on certain days, and Monday the 29th was that day for our time in the city. We would have gone regardless, but we wanted to know how wet it would be on the track. As we checked after waking up, the weather still looked up in the air. We got downstairs and the morning was very laid back and relaxing. Toshi and Martha were going swimming, but Kara was also looking at the weather, wondering if it would be cold, and whether they should go, since the pool was outdoors. She eventually decided to go for it, just like us, and we headed to the track as she was getting the girls ready to go. It was pretty easy to get to Indianapolis Motor Speedway, and while there were several cars in the parking lot, there were plenty of open spots; we were pleased that it wouldn't be too crowded inside. As we entered, we found a separate, temporary-looking table where the grounds tour tickets were being sold, and there were still spots for the 11:15 tour, the one we were targeting. We had a little less than an hour before it started, so we started wandering through the museum. There was a 20 minute movie, and figuring we would still have almost a half hour before the tour after it finished, we took seats and watched about the early years of the track. Almost half way through the movie, someone walked in and asked if we were on the 11:15 grounds tour, and that it was boarding. We started going towards the bus, and the woman who sold us the tickets said that the bus was ready and waiting, then got on her radio saying that we were on our way. Having boarded the tour bus at 10:40 for an 11:15 tour, we were on our way. The first thing it did was go onto the track between turns one and two, then went down the straightaway. It gave one a good feeling for just how large the track is. We heard various facts about the track, grandstands, and the Indianapolis 500 from both the recording and the guide as we went around. As the bus was pulling up to the start/finish line, it slowed down, and the tour guide sounded concerned. The bus stopped, and the driver was having getting it started again. He called for a replacement bus while the tour guide gave us more facts before we were to get out of the bus. The driver got the bus started again, but they were still have us go to a different one just in case. While we were still in the bus, the guide gave us rough guidelines for the area we should stay within, and added that we shouldn't climb the fences like Hélio Castroneves. We stepped out and were right at the start/finish line, and the yard of bricks just past it. You could see the bricks not only extend across the track, but past it through the pits. Of course, lots of people were taking selfies standing, sitting, or lying on the bricks. Several people also knelt down and kissed the bricks, which is what the winner of the Indianapolis 500 does. Another thing we saw was a two seat Indy car going through the pit lane. It passed us a couple times, and while it wasn't going all that quickly, you could still hear it and see how quickly it went past when one was standing nearby. We piled into the replacement bus, which took us to the room where press conferences are held. While there were quite a few seats, the room itself seemed somewhat small. After telling us about the room, the guide let people have their pictures taken behind the podium. We then went up to the press box, and the guide explained the press used to be at the top of the stands on the outside of the track, so they were quite a bit happier with the new location. When we were in the room, things were being rearranged since the Rolling Stones were going to use it as a suite for their upcoming concert. We then walked over to one of the luxury suites, where for $70,000 (food and beverages not included) you could have up to 80 tickets for not only the race, but also the days leading up to it. He also took the opportunity to talk about the larger screens and new position pole, which is now a full video screen, rather than a display which only showed the order of the racers. That was our last stop, but on the way back to the museum we drove through Gasoline Alley, and were shown not only the team garages, but those of suppliers; in case a team needed support from a vendor, that company would be on side. Upon returning to the museum, we continued our walk through the exhibits. When the movie had been running for a while, we went in, and didn't have too much overlap from when we were watching before. Back in the exhibits again, and it was interesting to watch all the various styles of cars and even early racing motorcycles. Down the middle of the museum were some pace cars and a 2011 car on a platform that you could walk all around. The last section we looked at was the hall of fame, where winning cars were on display. While walking through that part, we heard the announcement for the next tour; again, they were boarding more than a half hour early. Not only that, the announcement was hard to miss, but I guess they don't broadcast it where they show the movie, which is why we missed it. We continued looking at the hall of fame, and it was fun to see some of the cars which were described in the movie, such as a car with a diesel engine. Having finished with the track and museum, we were ready for lunch. Doing a quick search, I saw a listing for The Tamale Place, mentioned it to Melody, and we quickly agreed that would be the plan. We showed up and got a pork/red sauce tamale wrapped in banana leaves and a poblano/cheese tamale. They came up quickly, and both were great. Of course, we split each to be able to taste both of them. Next, we wanted to find a place where we could do some walking. Our first attempt ended up having a fee for day use, and since we would only be walking for an hour or so, we decided to look elsewhere. I saw a listing for 100 Acres, and we set out to find that. We had no trouble finding information about 100 Acres, but did have trouble finding exactly how to get there. One map sent us to the wrong park, and the other just sent us to the Indianapolis Art Museum. We went with the latter, figuring that since the park was associated with the museum, perhaps we would be able to find a path. We found a map in the museum parking lot, but the path which went to the bridge towards the park didn't seem accessible other than through the museum. 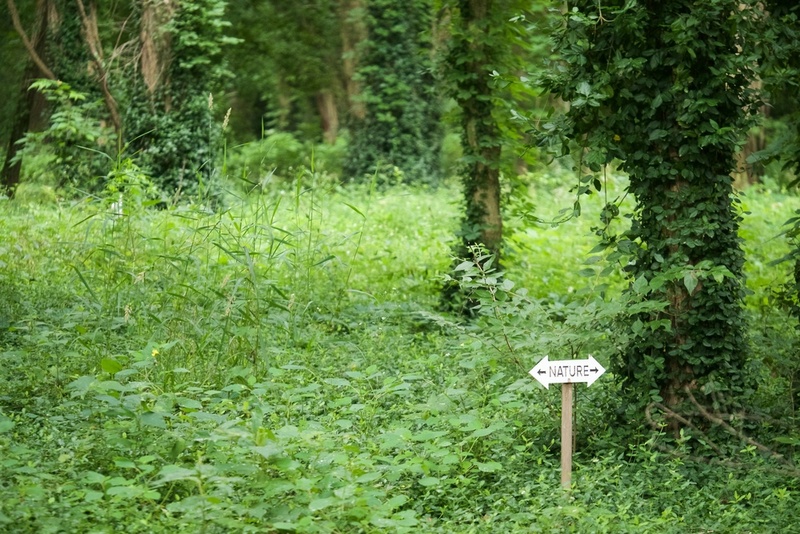 We did find another path around the grounds (the gardens themselves were also inaccessible) so did that. After we got back towards the car, I noticed what looked like a parking lot on the map (it was quite stylized, which is why it didn't occur to us before) and decided to check it out. It ended up being not too hard to find the 100 Acres parking lot, so we got ready to see what we would find. 100 Acres has pieces of art sprinkled around, and has a combination of lawns, paths through woods, and a huge lake. The map indicated that one part of the path around the lake may be washed out, and with all the high rivers, we figured that might be the case. We wanted to check it out anyway. 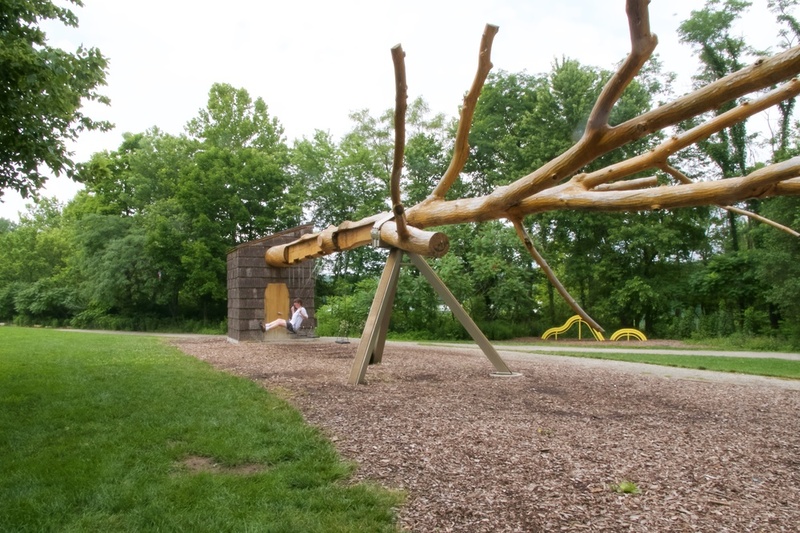 It doesn't take long to see the first installations, one of which is a huge tree lying sideways, Chop Stick by visiondivision. Swings hung from it, so of course we had to try it out. 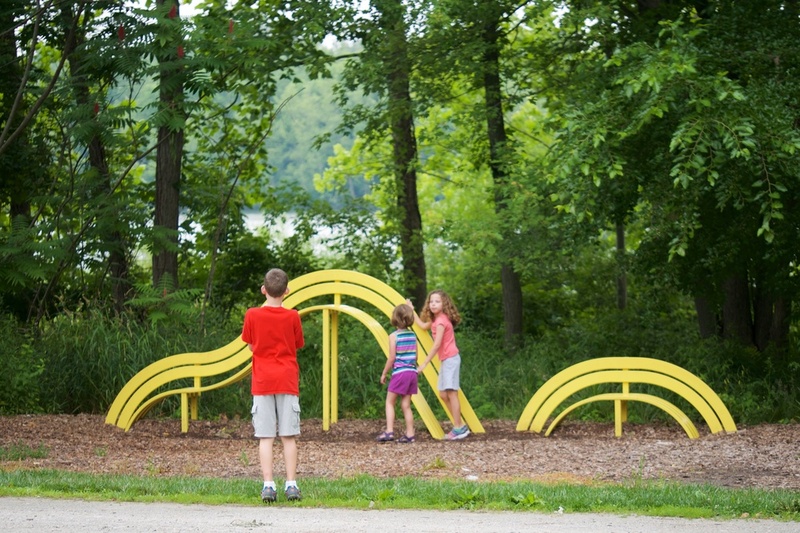 Nearby was a yellow bench which looked quite stylized; it ends up that was one of several bench pieces throughout the park, Bench Around the Lake by Jeppe Hein, each which starts with what would be a normal bench but gives it a twist (sometimes literally); they were one of my favorite pieces in the park. Going around the lake, we saw a dock, so went to take a look. Ends up it's also an installation, Stratum Pier by Kendall Buster, and allows you to walk right up to the lake and look out. However, the lake was so high, the lowest platform was completely under water. Walking a little more around the lake, we saw a sign indicating that part of the path was closed, although it didn't look terrible. 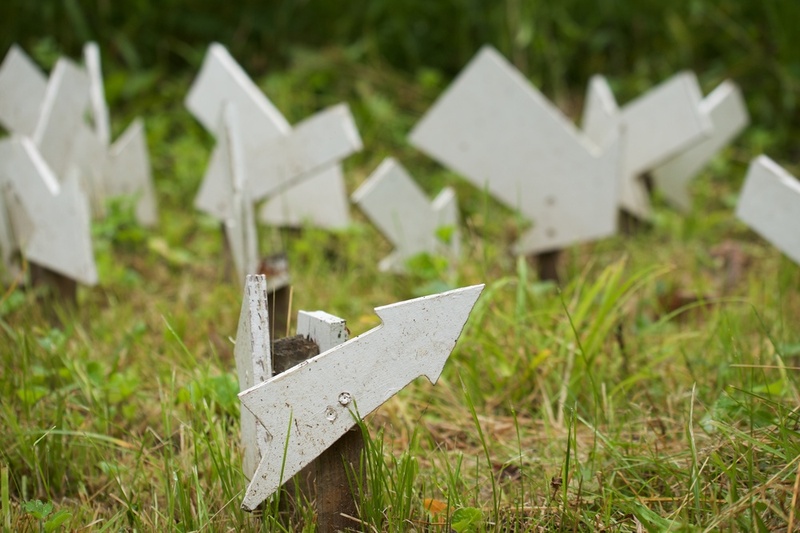 We headed back, however, and then a bunch of sign posts caught my eye, figuring it would be another piece. It was NOTICE: A Flock of Signs by Kim Beck, and ended up being my favorite. We laughed at practically every sign (pointing to things like “Tree”, “Sky”, or “Dutchman's Breeches aka Staggerweed aka Eardrops aka Dicentra Cucullaria: Noxious wildflower historically used as a love charm”). Easily my favorite installation of the ones we saw. Proceeding further around the lake, we saw more benches, and even more signs. Eventually we ran across another sign saying the path was closed, and just beyond it the path was completely under several inches of water. We then walked past the closed visitor center, took a look at the bridge which crosses over the canal to the art museum, and found our way back to the car. We got back to the Mealy house just before Kara was taking Martha to ballet class. Before leaving, Martha gave us a demonstration, and it was great. Toshi gathered things in a tote bag to keep herself occupied during the class, and off they went. Melody and I relaxed and caught up with things online; that should come as no surprise, as it's a common theme among all our vacations. After Martha's ballet class, we got into a couple cars to go to dinner. Melody rode with Paul and Martha, while I rode with Kara and Toshi. We went to Bub's Burgers, which features a burger that's 16oz after cooking. None of us opted for that, but Melody and I had an elk burger and cole slaw, which was quite good. We all got sweet potato waffle fries; Kara also ordered some marshmallow dip for their fries, which went quite well with the sweet potatoes. On the way back to the house, Melody and I switched cars for the quick ride back to the house. After the girls got to bed, we were able to chat for a while, catching up on our days. The day had gone by so quickly, and the next thing we knew, it was time for us older folks to get some sleep.